Enjoy this Peruvian Quinoa Porridge with Amaranth on a cold winter morning. Keep it simple or add whatever you want to it. Seasonal fruits are always a winner, but so are berries or pomegranate seeds for those days where you're feeling a little lazier. In a small saucepan, add the amaranth, black quinoa and water. Bring to a boil, then turn down the heat to low. Simmer, stirring occasionally, uncovered for 20-25 minutes, until most of the water has been absorbed. Stir in the almond milk and maple syrup. Continue to simmer, stirring occasionally, until the porridge is creamy and the grains are cooked through, about 5-10 minutes. Remove from heat and allow to sit for 5 minutes. The porridge will thicken slightly as it cools. Serve in a bowl, and top with almond milk, maple syrup, pomegranate seeds and pistachio kernels. Adapted from the Eat Hackney Cookbook. The Eat Hackney Cookbook raises funds for North London Action for the Homeless and the Hackney Migrant Centre. 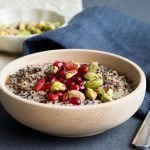 Get this recipe for Peruvian Quinoa Porridge with Amaranth (Vegan, GF) at https://www.theworktop.com/breakfast-brunch-recipes/peruvian-porridge-quinoa-amaranth-vegan-gf/.